Dr. Chorney’s research interests are in children’s health (acute and chronic pain) and children’s coping with surgery and stressful medical procedures. She is interested in conducting applied research that has implications for how healthcare is provided to children and families. As a clinical psychologist with the complex pain team at the IWK Health Centre, Dr. Chorney is also interested in projects examining the impact and treatment of chronic pain in children and adolescents. Funding for Dr. Chorney’s research has been provided by the Canadian Institutes for Health Research, the Canadian Foundation for Innovation, the Nova Scotia Health Research Foundation, IWK Health Centre, Dalhousie University and the National Institutes of Health. Children with autism spectrum disorders (ASD) have unique sensory, emotional, and communication needs that can make healthcare experiences challenging. 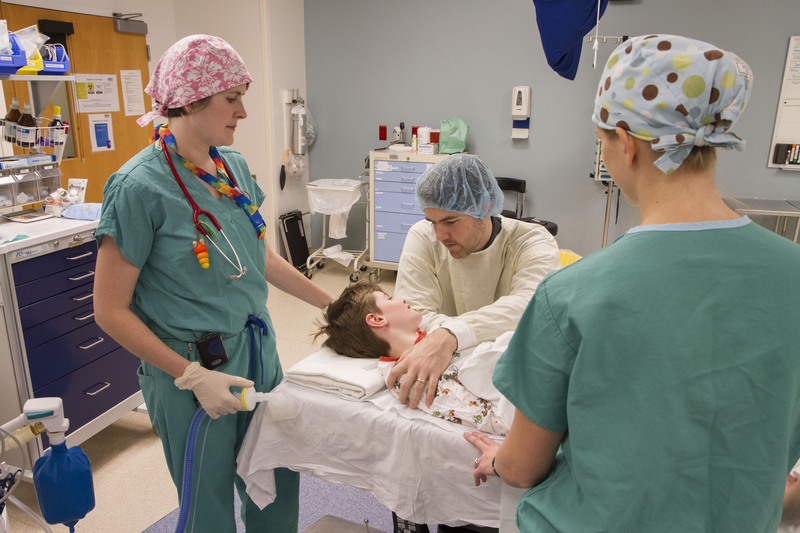 Surgery can be especially challenging for children with ASD because it involves children meeting many new people in a fast paced environment with lots of sensory stimuli (bright lights, cold operating rooms). Under the leadership of PhD student Stephanie Snow, Researchers, staff in the day surgery unit, and families of children with ASD have been working together to create ways to help children with ASD, their families and their healthcare providers feel more comfortable around the time of surgery. The first step involved interviewing important stakeholders to learn more about the experiences of children around the time of surgery. We summarized our results in a video… check it out below. We took our video back to parents of children with ASD, healthcare providers and administrators to figure out where we should go next. In our consultations, healthcare providers told us that they wanted more education and support to enhance their delivery of family centred care to children with ASD. Families of children with ASD told us that they wanted their healthcare providers to feel comfortable partnering with them in providing care. To address these needs, we took this feedback and developed an electronic education tool for healthcare providers called the Building ALiances for Autism Needs in Clinical Encounters: Surgery Edition, or BALANCE for short. BALANCE provides information and interactive activities that are designed to help healthcare providers learn more about ASD and practice ways that they can effectively tailor their care to meet the individual needs of each child and family. The program also includes activities designed to encourage healthcare providers to work together and support one another. BALANCE delivers much of its content through videos featuring children with ASD, their families, healthcare providers and researchers. Testing of BALANCE includes collecting information from families of children with ASD about their experiences having at the IWK before and after the program is rolled out. We will also collect information from the healthcare providers who participate in BALANCE to learn about what they liked and would change about the program and whether it enhanced their care. Once tested, we hope to incorporate BALANCE into the orientation of all new staff and work on adapting it for other procedures and health centres. We are currently working with the Diagnostic Imaging Department at the IWK Health Centre to test a video game as a preparation tool for children undergoing MRI. We are looking at the trajectory of pain and recovery of adolescents in the first year following posterior spinal fusion surgery. This is a CIHR funded multi- site study. Using the Ottawa Decision Support Framework, our research team has developed an alpha prototype of a decision aid tool to help guide the discussion between surgeons and patient families deciding whether or not to pursue a tonsillectomy and/or adenoidectomy for the treatment of sleep apnea. Our team is piloting this tool in the ENT departments at two teaching hospitals to better understand the feasibility of using the tool in a clinical setting. Parents are often responsible for managing their child’s recovery at home after common surgeries like tonsillectomy. Pain management is important for good outcomes after surgery, but it can be a challenging task for many families. We did this study to understand what it is like for parents to manage their child’s recovery at home, and to learn what healthcare providers can do to help support them. 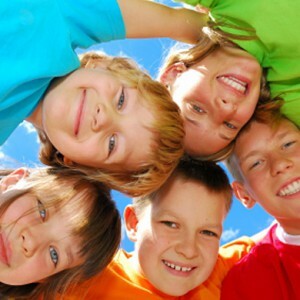 Parents reported that all children experienced some amount of pain after their tonsillectomy. Parents’ experiences of managing their child’s pain were impacted by balancing the pros and cons of giving their child pain medications and managing the emotional impacts of their child’s pain. Most parents said they had the information they needed but they still struggled to manage their child’s pain. This study helped us learn about some of the barriers that make the recovery process challenging for many families. We also learned more about what healthcare centres like the IWK can do to help support parents better. We hope this research will help healthcare providers better support parents when managing their child’s pain after surgery and thus improve children’s experiences. Many parents want to be present with their child when the child has anesthesia for surgery. We do not know the best way to prepare parents to help their children (and themselves) be less anxious during this time. 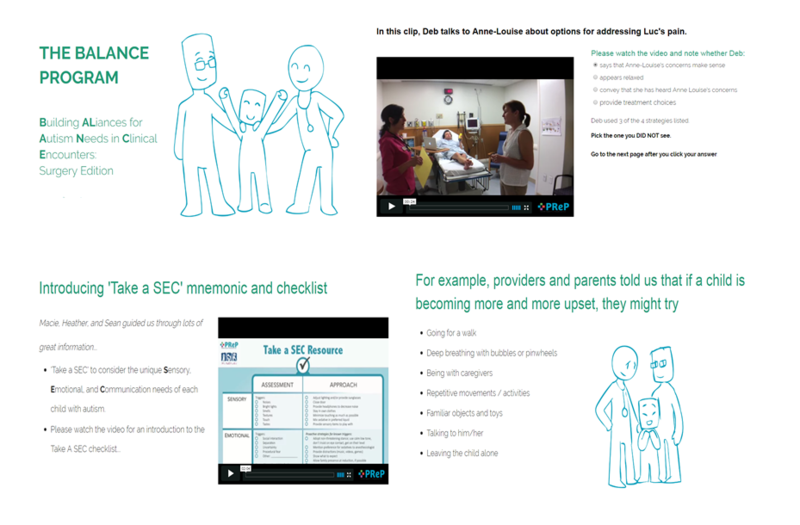 In this study, we tested a newly developed video to prepare parents to be present at anesthesia induction. We wanted to see how preparing parents to be present during their children’s anesthesia induction related to the child’s anxiety, the parents anxiety and confidence and how the child did after their surgery (e.g., pain, time spent in the recovery room). We found that parents who were prepared with the video were more confident about what they had to do during their child’s anesthesia induction than parents who were prepared in the usual way. We did not find that the video had any impact on the parent’s or child’s anxiety nor did it have any impact on the amount of pain the child was in after their surgery or the amount of time they spent in the recovery room. While many parents said that the video was useful, parents and children may need more time to prepare than they were given in this study. Parents may also need extra support in order to help their child during anesthesia induction. We are going to use what we have learned in this study to create a better way to help parents and children be prepared for anesthesia induction. Once we have created a new way to prepare parents and children we will again be testing it with children and their parents who are scheduled for surgery at the IWK. How children remember early medical procedures has an impact on how they act during later medical procedures. There has been little research on what children remember about their first surgery or how accurate those memories are. We conducted a study to see what children remember about their surgery and how accurate these memories are so that health care providers can better prepare children for surgical procedures. Thirty four children who had surgery took part in our study. Before and after their surgery they answered questions about their pain and fear and on their walk to the operating room they were shown various paintings and objects. Two weeks after the children left the hospital a research assistant called them to ask what they remembered about the their fear, pain and the things they were shown on the way to the operating room. Results of our study showed that children remembered about 2/3’s of the things that they were shown before their surgery and were fairly accurate remembering how they felt before their surgery but some children remembered more or less fear and pain than they reported on the day of their surgery. It’s not clear why some children remember being in more pain on the day of their surgery. Future research is needed to better understand why children remember more pain on the day of their surgery and how these results can be used to better prepare children for surgery. Adverse health care events are injuries that occur as a result of patient care. It has been argued that under managed pain in children who have undergone medical or surgical procedures would be considered an adverse event. Currently, there are not any validated indicators that can be used to identify under managed paediatric pain. The Delphi technique, a scientific technique that relies on the judgement of an expert panel to develop a consensus about a subject area, was used to survey experts in paediatric pain management and quality improvement. A number of indicators of under managed paediatric pain were identified and separated into indicators for post-operative and procedural pain. Examples of post-operative indicators include: no pain assessment tool is used, no analgesic drugs are prescribed, and the parent or the child is not involved in decision-making about their pain management. 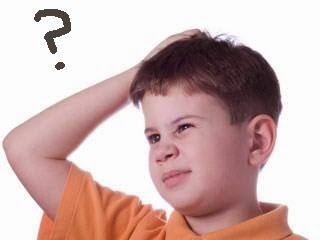 Examples of procedural indicators include: child is not prepared for the procedure, child is distressed during the procedure, and the child is not satisfied with the management of pain during the procedure. Indicators were also separated depending on whether they were identified from chart review or from observation of practice or assessment from the child or parent. The indicators developed in this study need further refinement and need to be tested for clinical usability to determine if they actually identify under managed pain in clinical practice. This study is an important first step in identifying under managed pain in hospital and treating it as an adverse event. Many teachers feel ill-prepared to work with students with chronic pain in the classroom and are requesting increased information and support from the medical team. To address these concerns, a website for teachers was developed to target both information dissemination and collaboration between the school and the healthcare team. Usability of this tool was assessed using a two phase approach. Phase 1 consisted of the initial website development. Phase 2 examined its usability with three groups of stakeholders; teachers, children with chronic pain, and their parents. Analyses revealed that all three groups of stakeholders found the website easy to use, easy to understand, and would either use the website themselves (teachers) or would recommend the website to teachers (children and parents). 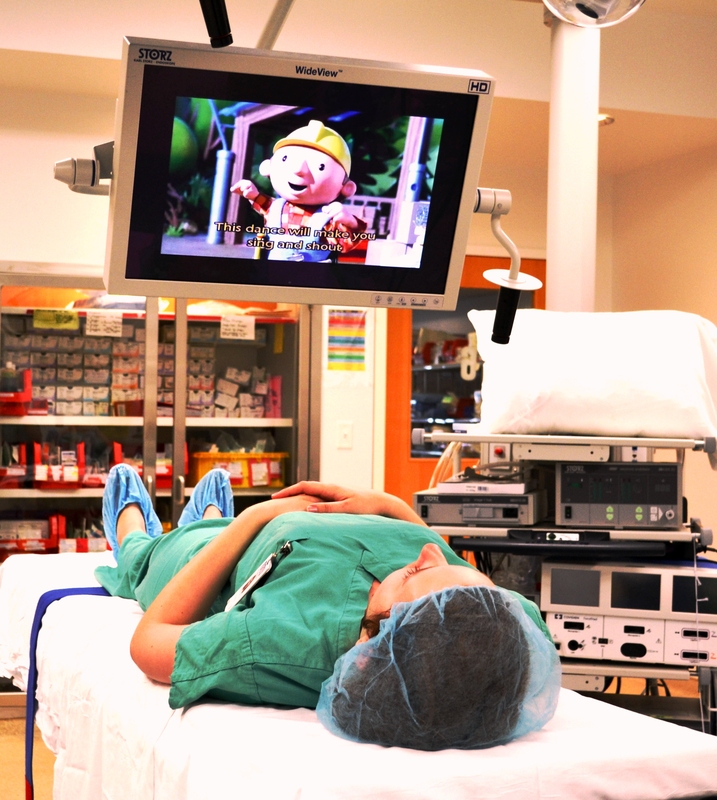 Anesthesiologists at the IWK noticed that playing video clips for children while they fell asleep for surgery seemed to make them less anxious. They asked the research team to help them design a study to see if this was really the case. We asked 89 children to take part in the study. 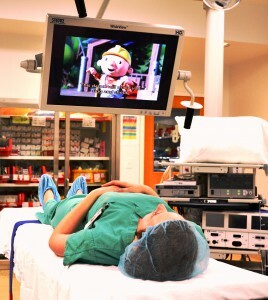 Forty two of the children were asked what their favourite show was to watch at home and then watched this show while they fell asleep for surgery. The other forty seven children didn’t watch a video clip, but instead played the “balloon game” with operating room staff, were told stories, or got another form of distraction from the anesthesiologists while going to sleep. While children were going to sleep, a research assistant was in the room to observe and record how anxious they were. After seeing all of the children fall asleep for surgery and recording how anxious they were, it was discovered that the children who watched a video were less anxious than those who did not. Now anesthesiologists will be able to play video clips for their patients while they fall asleep for surgery and know that their patients will be more relaxed. Here you can see a research assistant demonstrating how the children were able to watch videos in the operating room while falling asleep. Many young people with chronic pain tell their doctors that their pain makes it difficult for them to concentrate and to remember things. Studies in adults with chronic pain have found concentration and memory problems in those patients. We did this research to see what kinds of concentration and memory problems teens with pain had compared to teens without chronic pain. To do this, researchers recruited 13 teens with chronic pain and 21 teens without pain. Tests of attention and memory as well as paper based tests about other factors related to pain were given to all of the teens in the study. We found that there were differences in concentration and memory between groups and that the teens with pain generally had more difficulty on the attention and memory tests as a group. These differences were seen most strongly on the working memory test and on the most difficult attention tests; this is the same pattern of results seen in adult studies. We also found that pain was more important than depression or sleep problems when it came to what might be related to the concentration and memory problems. Finding differences in these areas of attention and memory are important to everyday function as they are often involved in things teens do every day, like going to school. We also looked at how medication affects concentration and memory. We did not find a clear answer to this question but our results hinted that good pain treatment might help teens have better concentration and memory. As a result, we need to study the effect of medication more in the future. Overall, this study helps us to better understand concentration and memory problems in young people with chronic pain. Surgery can be a stressful experience for children and families, since the 1960s preoperative preparation has been used to prepare and help reduce the stress for these individuals. Most children’s hospitals currently offer some degree of preparation, unfortunately there is currently no systematic review of research on pediatric preoperative preparation and no evidence-based guidelines available. The objective of this project was to conduct a stakeholder-informed review of the literature to answer the general research question: What is known from the current literature about the effectiveness of preparation programs for children undergoing surgery and their families. A systematic review was conducted of efficacy studies that met the inclusion criteria: participants were 2-18 year old, interventions were delivered before induction of anaesthesia, design was randomized or quasi-randomized and validated outcome measures were used. A narrative scoping review was conducted to examine tailoring characteristics.Results of the systematic review indicated: *Preparation programs reduce children’s anxiety on the day of surgery as compared to standard care. 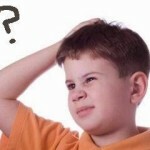 *Results of preparation on other outcomes (e.g., pain, satisfaction) are unknown. *There are few differences between types of preparation, and programs may be effectively delivered via the Internet. * Information that may be helpful in tailoring preparation programs includes parent and child anxiety, coping styles, and children’s previous experience with medical procedures. * Preoperative preparation is an effective way to reduce children’s stress on the day of surgery.There are few differences between types of preparation (play therapy, modelling, coping skills training), but all are better than standard verbal and written information.